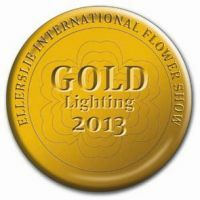 I'm delighted to have helped a student win the Gold Lighting Award at the recent Ellerslie Flower Show in Christchurch. You'll remember the story from the last newsletter where I explained how I was working with Bayley LuuTomes of the Wellington Open Polytechnic on his garden for the show. I'm so proud to have been involved in his win. He was a pleasure to work with. I'm sure he'll go a long way with his career in outdoor design. Because his entry was a rooftop garden, it had to look spectacular and eye-catching, but also be highly practical. It had to highlight the beauty of the plantings and the landscaping. I'm pleased the judges recognised how the design Bayley and I came up with ticked all the boxes. Bayley deserves special mention for his award, because entering into such an exclusive event is not cheap. He went about his business with a limited budget. Apart from my complimentary services, he stayed at the YMCA when in Christchurch and enlisted the help of others willing to waive their fee. This shows his passion and dedication to his work, and makes his victory even more deserving.